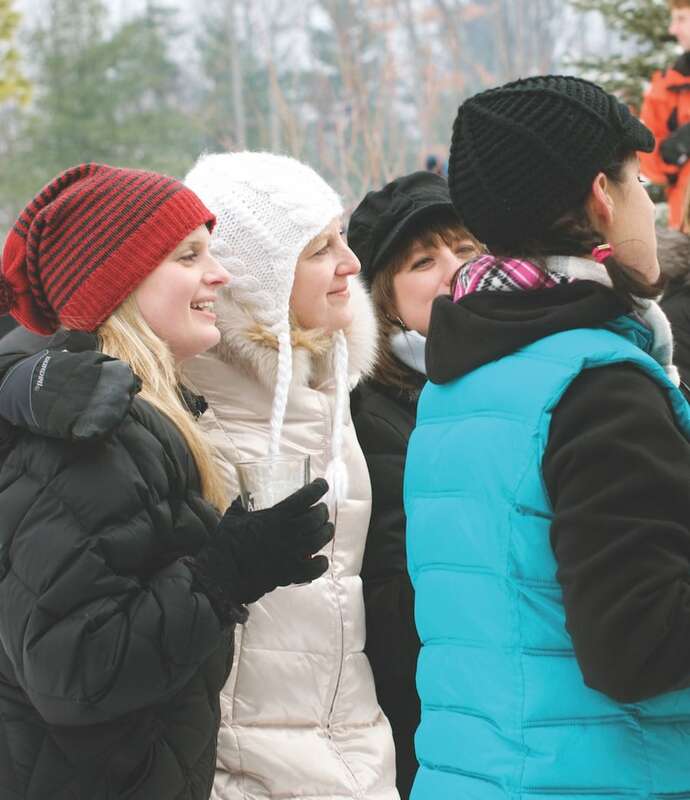 Find the snow and dive into these Northern Michigan winter festivals. This two-weekend-long festival in Houghton Lake is proof we Michiganders don’t let winter slow us down. In fact, the event’s lineup gives you most of what you’d expect at a summer celebration, including carnival rides, outdoor concerts, and a petting zoo. Of course, you can also partake in some cold-weather staples like an ice fishing competition and—if you really want to prove your northern mettle—the Polar Bear Dip. January 18–20 and January 25–27. We’re not surprised one of Michigan’s northernmost cities has given rise to one of the country’s largest and longest-running winter festivals. The annual Winter Carnival in Houghton includes elaborate and massive snow sculptures, sleigh rides, a winter queen pageant, a beard-growing contest, a broomball tournament, and plenty of other antidotes to cabin fever. February 6–9. This day is jam-packed with activities for all ages. Go bowling with frozen turkeys at Beulah Park during the chili cookout, test your snowball-throwing accuracy at the target competition, watch the Winterfest parade, and wrap the day up with fireworks and a bonfire on the beach. February 9. For more than 90 years, this event has had one of the most packed lineups of any Winterfest in the North—including a full day of carnival activities just for the kids. Outside, enjoy sledding, curling, figure skating, several hockey games, and a broomball tournament. Then get toasty inside at wine tasting events and a progressive dinner at downtown establishments. February 14–17. This small-town festival keeps it earnest and low-key with an all-ages perch-fishing contest on Big and Little Glen Lakes, a chili cook-off, and an outdoor party on the deck at Boonedocks. All proceeds benefit the Glen Lake Schools Scholarship Fund. February 16. Established in 1965, this festival celebrates the true “Up North” spirit. Look for treasures at the craft show and watch as sled dogs overtake the town in the largest sprint sled dog race in the lower 48. February 23–24. First-time skiers and snowboarders are front and center at this internationally celebrated event designed to introduce youngsters and newbies to the world of winter sports. Best of all, Crystal Mountain’s full-day local festivities are completely free. January 20. Pack as many friends, family members, neighbors, and anyone else you can find into your car and head to Schuss Mountain. Everyone skis or rides for $69 per carload. January 21. Reconnect with familiar faces and make new friends at this weekend party that’s rich in old-school, family-friendly charm. Warm up at the community bonfire before heading out for a night cross-country ski, a torch-lit snowshoe walk, and cardboard sledding. Then head back in for drinks, dinner, live music, and dancing. End the night with fireworks. January 25–27. This spring break, give a nod to our northern neighbors. Boyne Mountain is set up for family fun with scavenger hunts, zip line tours, snowshoe suppers, tubing, and more. March 10–15. 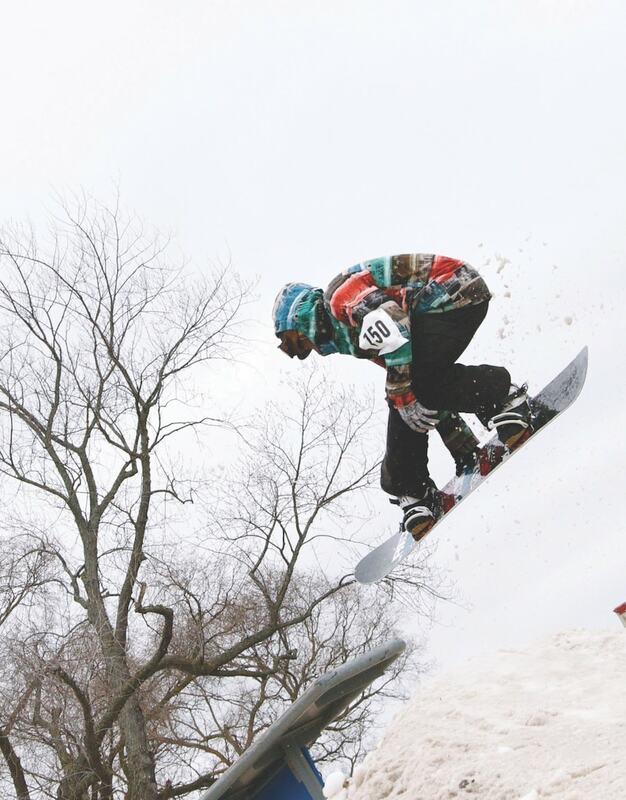 The ski and snowboard events at this annual winter party are geared toward the brave, with a big air contest and “rail jam” at Jibber’s terrain park. But if you’re favoring a lower-key weekend, head straight to the bottom of the hill to enjoy food, drinks, and live music at the outdoor bar and grill. Try to snag a prize for best-dressed at the “Halloween in the Spring” costume parade. March 17. The flagship event of this Mardi Gras celebration is no doubt the Soaker Cup—a downhill ski run where thrill seekers attempt to coast across an unfrozen section of Lake Nubs. For those who prefer to not risk taking an unplanned dip, there’s also a full day of games, ski races, and music. March 23. Chateau Chantal has been making ice wine for more than 20 years. In celebration of the remarkable wine, festival events will range from family friendly snowman building and ice sculptures to outdoor fire pits with roasted treats. The winery’s walking trail will be open for snowshoeing or skiing. The festival will culminate with a multi-course ice wine education dinner on Saturday, including a tour of the cellar and winemaking process. Samples of several ice wines and pairings will be available all weekend along with a specialty dessert item. Entrance to the festival is free, with a fee to sample and attend the wine dinner. January 25–27. This favorite winter beer festival is in its fifth year, featuring 25 Michigan brewers for an afternoon of beer, live music, and more. Tickets ($25 in advance online or $30 at the door) include a 5oz. commemorative sampling glass plus six drink tokens for sampling. Proceeds benefit the Friends of Ludington State Park. January 26. This first annual fest will have ice sculptures, a chili cook-off, broomball tournament, and more. You’re just going to have to go and find out! February 8–10. Sample all the incarnations of the grape that’s become one of the all-stars of the Northern Michigan wine scene, while touring the rolling wine country of Old Mission Peninsula. Tickets earn you samples at multiple tasting rooms, a souvenir glass—plus the good cheer of other riesling lovers. Designated driver tickets available. February 16. Not to be outdone, this two-day annual winter tour of the Leelanau Peninsula’s celebrated wine trail pairs local wines with sweet and savory small plates and pop-up shopping. Get in on the “Snow Fun” photo contest and put yourself in the running for event swag, which includes a complimentary souvenir glass. Grab a lodging package and make a weekend out of it. Designated driver tickets available. February 9–10. Join Boyne Highlands for the second annual Winter Wine Tasting, featuring 12 vendors from Republic National Distributing Company who will carefully select six to eight wines exclusively for the event. Enjoy unlimited tastings and light hor d’oeuvres to complement the delicate flavors and bouquets. Guests will have the opportunity to purchase products from each vintner in attendance. February 23. With a focus on locally sourced foods, Traverse City’s dining scene has emerged as one of the most dynamic in the state—so much so that it can be hard to keep up with all the inventive menu changes and recent restaurant openings. Catch up on everything you’ve been missing. Three-course menus will be available for $25 or $35 per person at dozens of participating downtown restaurants. February 24–March 2. Now 13 years old, this annual party at Timber Ridge bills itself as TC’s “original winter microbrew event.” Enjoy craft brews, wine, and cider from more than 20 local breweries; food from local vendors; plus live entertainment at two hike-in music stages in the middle of the woods. March 2. Proceeds from this 5K/10K race support conservation and education work at the wooded wetlands of the Grass River Natural Area. The $20 registration ($25 the day of) also gets you a free soup lunch at Short’s Brewery on race day plus after-race snacks and refreshments. January 12. This feel-good winter event is about as straight up as it gets: simply show up, rent a pair of snowshoes if you don’t have your own, then hit the trail for a lighthearted 5K or 10K through the hilly terrain of TC’s Timber Ridge Resort. Many participants are first-timers, so don’t be shy. Though if you want to learn a thing or two about good form, watch for the handful of serious snowshoe racers who use the Bigfoot as a qualifier for February’s U.S. National Championships. January 26. One longtime organizer calls this premier cross-country ski event “the biggest family reunion on the planet,” and with more than 40 years of history, we don’t doubt it lives up to its billing. Test your endurance on either the 26K or 50K course. Or if you prefer to focus on the scenic Antrim County surrounds, try the non-competitive 10K event. Proceeds benefit the Children’s Hospital of Michigan Foundation. February 2. By popular demand, the “Freestyle Saturday” and “Classic Sunday” format continues. Short’s Brewery is also back as an event sponsor, so expect a full lineup of their creative craft beers at the post-race event tent. And don’t miss Saturday’s fat bike races and Junior Vasa—plus the return of the “Skifatalon,” a combined ski/fat-bike competition on a 27K course. February 9–10. Even if you don’t know much about sled-dog culture, every Michigander owes it to herself/himself the experience of taking in at least one running of the UP200. The 230-mile contest—the state’s flagship sled-dog event—is actually just one of three races that take place over four days, meaning you’ll have multiple opportunities to take part in the cacophonous start-and finish-line festivities—and all the celebrating that happens in Marquette in between. February 14–18. “Pond” might not be the most accurate term when describing the setting for this annual outdoor hockey tournament in St. Ignace. The games, after all, are played on a frozen coastal stretch of Lake Huron. But when you have more than 200 teams battling it out across 75 rinks for one of the most coveted prizes in amateur hockey, you’ll need the extra real estate afforded by a Great Lake. February 14–17. If there’s a winter sports event with a more scenic setting, we’re not aware of it. This annual snowshoe race starts at the Upper Tahquamenon Falls and winds its way through majestic stands of white pines, cedars, and hardwoods. Choose from either a 5K or 10K on the groomed course. February 16. Check out the beer tent with live music, snowmobile races, sled rides for the kids, and a slice of snowmobile history at the vintage sled show. There is no cost to register. February 23.